One of Eduard’s more complex Brassin sets is this replacement R-2800 engine intended for the recent G.W.H. 1/48 P-61A kits. It could probably also be adapted to fit the Revell/Monogram P-61, although a quick look at my Revell P-61 suggests that fitting the Eduard assembly to the older kit will require some fettling. 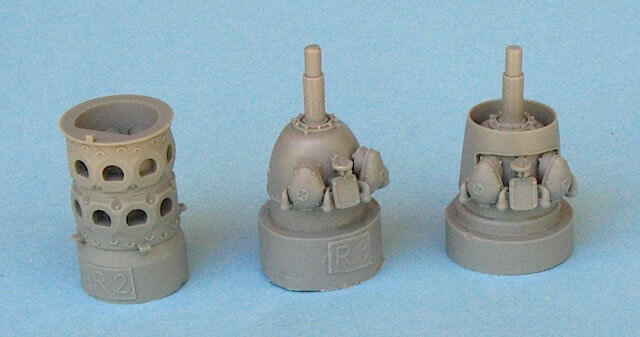 With 40 resin and nearly 20 photo-etched parts, the Brassin R-2800 engine is a mini-kit in itself. As you would expect with a set like this, assembly proceeds in layers, beginning with gluing both banks of cylinders to the crankcase. The cylinders are provided as separate parts, but their location points look positive and Eduard’s assembly instructions are clear, so if you take your time this should be a reasonably straightforward job. The pushrods have been cast integrally with the front bank of cylinders, eliminating the need for measuring and cutting fiddly lengths of plastic rod. 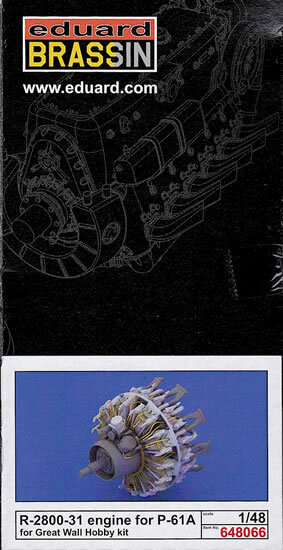 The ignition harness is supplied as a single photo-etched part, which needs to be cemented to the front of the crankcase before the reduction casing is attached. Patience is definitely required here, because all 36 individual ignition wires have to be teased and glued into their correct locations; they’ll also benefit from a coat or two of paint to reduce the two dimensional ‘flatness’ of the photo-etched brass. 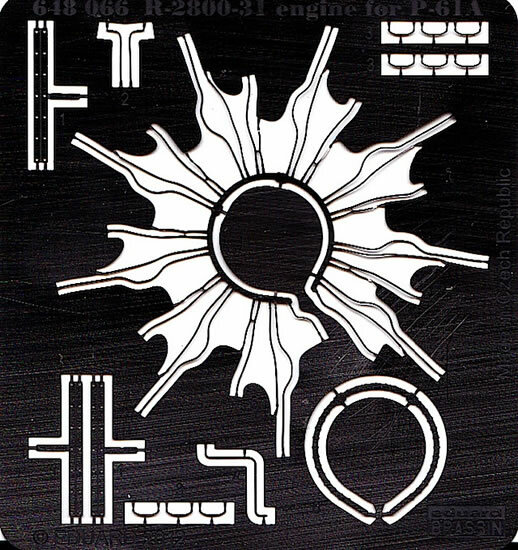 The photo-etched fret also contains a number of smaller detailing parts for the engine. Two different types of reduction casing are provided, so check your references to see which is appropriate for the machine you are modeling. For the rear of the engine, the intake manifold has been cast as a single item, while the separate exhaust stubs have delicately recessed tips. 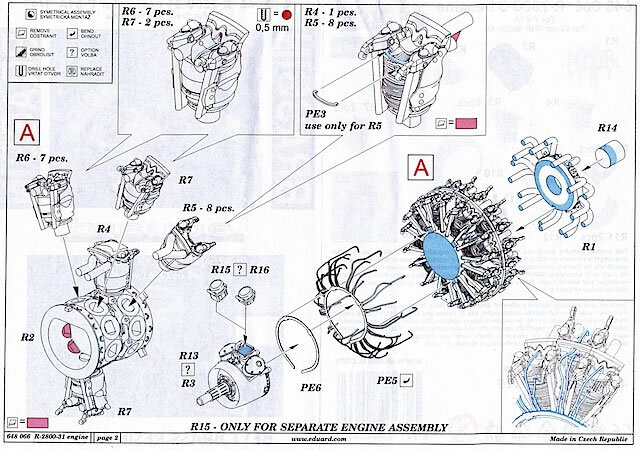 No engine detail is provided beyond the intake manifold, because it won’t be visible on the finished model. The two largest parts of the set are the cooling flaps and the forward cowling. The flaps are fragile – I clumsily broke off two while taking photographs – but beautifully detailed. They are attached to a substantial casting block, which will need to be removed with great care. The forward cowling is also gorgeously cast, but replicates the dimensional errors of the G.W.H. part it is intended to replace in that the cowl opening is too small in diameter. (And comparing this with both the equivalent part on the Revell kit, and the corrected cowls in Brett Green’s build of the G.W.H. 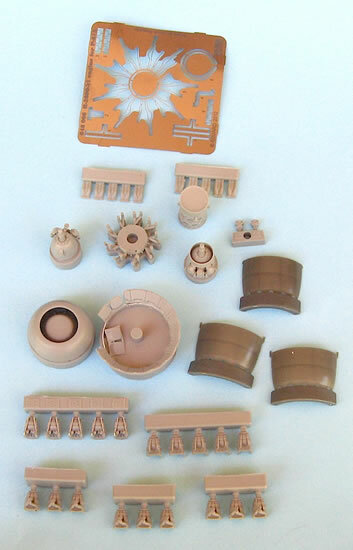 kit in Military Illustrated Modeller, it really is very small.) I think I can understand Eduard’s rationale here: the set only provides parts for one engine, so if Eduard supplied a corrected cowling then modelers would be obliged to modify the plastic G.W.H. 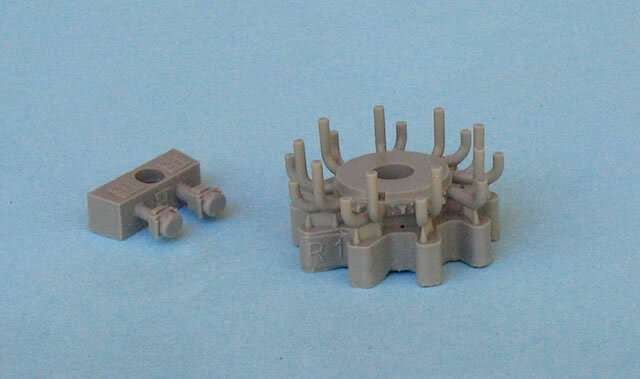 cowling used on the other kit engine. As Brett’s build article shows, this isn’t a difficult task, but not all modelers purchasing the Brassin engine will be aware of the issue and/or feel the need to address it. Eduard’s other option would have been to supply two corrected cowlings, but this would have made the set more expensive than it already is. 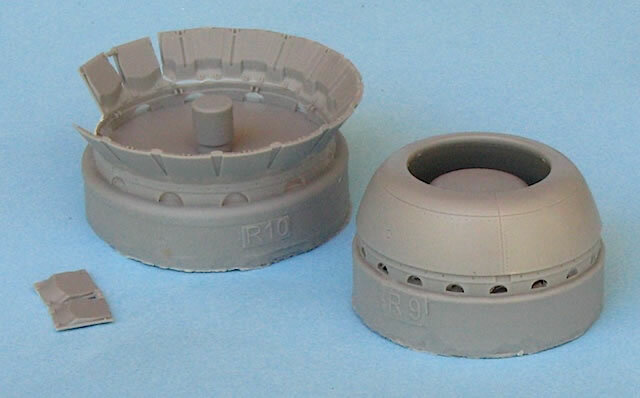 Finally, three engine access covers are provided – although presumably these are intended more for diorama display purposes rather than covering up all that lovely engine detail! Casting quality is near perfect. An examination of the resin parts revealed no obvious flaws, and only a small amount of flash. As I have already mentioned, you’ll need to be careful removing parts from their casting blocks, but the attachment points look well engineered and don’t pose any obvious problems. 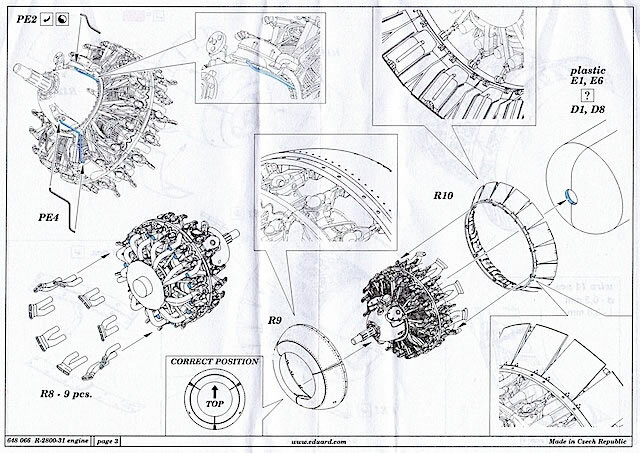 The instructions are set out over three A5 pages, with Eduard’s usual good quality line drawings providing a clear step-by-step guide to the assembly process. Eduard's Brassin R-2800-31 engine is probably best suited for modelers with previous experience in using mixed media detailing sets. But for those with the confidence to tackle it, the engine will make an eye-catching addition to the G.W.H. P-61 kit. The too-small cowl opening should be a straightforward resizing job for those wanting to correct it. Brett Green, “Nocturnal Nemesis”, Military Illustrated Modeller (November 2011). 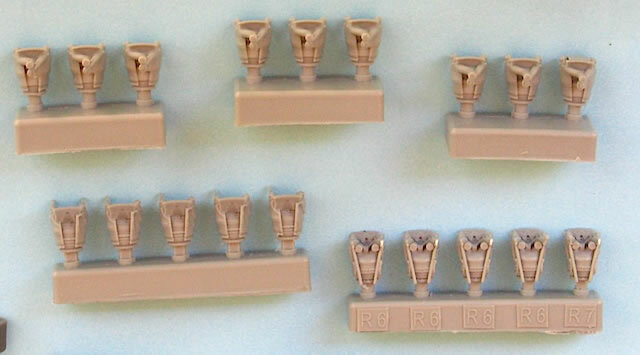 Warren Thompson, P-61 Black Widow Units of World War 2 (Osprey, 1998).